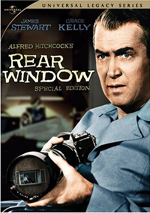 Vertigo appears in an aspect ratio of approximately 1.85:1 on this single-sided, double-layered DVD; the image has been enhanced for 16X9 televisions. This wasn’t a great transfer, but it satisfied. Colors often shined on this DVD and they were usually the best part of it. They could appear quite rich and lush and vibrant, as the photography demonstrated more than a few vibrant elements. Black levels appeared pretty good though inconsistent, and shadow detail also seemed largely appropriate but occasionally too opaque. Again, the filmmaking techniques may be mainly at fault; some "day for night" shooting appeared to have occurred, and those shots almost always looked too dark. I found the bell tower scenes to also seem overly dense, though. While the edge enhancement, minor print flaws and occasional softness created some issues, plenty of shots looked absolutely gorgeous. All of that made this an inconsistent but usually positive presentation worthy of a “B”. Although the DVD’s packaging claimed that the disc included a monaural soundtrack, this proved incorrect. Instead, this release provided a Dolby Surround 2.0 mix in addition to the 5.1 track. I’m not sure why it did so, as the 2.0 version sounded like a straight port of the 5.1 mix. 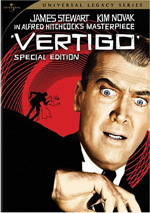 How did the picture and audio of this 2008 Vertigo Special Edition compare to those of the last DVD from 2005? Both appeared to present very similar visuals; the new one may be a bit tighter, but not by much. The 5.1 audio remained the same as well. However, the alternate English soundtracks differed. While this disc gave us a 2.0 Surround mix, the 2005 release included a monaural track. Honestly, that single-channel rendition wasn’t very good, as it came from poor source material. Nonetheless, it made sense to appear since it more closely represented the movie’s original audio. I have no idea why the mono track was replaced with a redundant Surround mix here. This 2008 Vertigo SE includes the supplements from the prior versions along with some new components. I’ll mark exclusive elements with an asterisk. If you fail to see a star, then the piece already appeared on the prior releases. On DVD One, we get two separate audio commentaries. For the first, we mostly hear from associate producer Herbert Coleman, who's paired with restoration team leaders Robert A. Harris and James C. Katz. 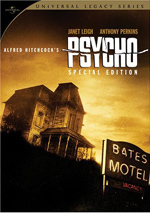 In addition, comments come from co-screenwriter Samuel Taylor and Bernard Herrmann biographer Steven Smith as well as actor Kim Novak, art director Henry Bumstead, former Paramount director of advertising and publicity Herbert Steinberg, script supervisor Peggy Robertson, and Hitchcock’s daughter Pat. The variety of speakers necessitates a fair amount of editing, but it still flows smoothly. For the new track, we find thoughts from *filmmaker William Friedkin. In his running, screen-specific discussion, Friedkin talks about the movie’s themes and interpretation, cast and crew, and a variety of minor film-related topics. At times Friedkin manages to provide some good insight, and he also contributes a few interesting stories such as his experience with Hitchcock as a TV director. Four decades later, Friedkin seems to remain bitter about the way Hitchcock treated him back then. If the commentary included more material like that, it’d be a bigger success. Unfortunately, Friedkin often does little more than narrate the movie. He does this well, as he makes it sound like he really has something to say, but he doesn’t; much of the time, he simply describes the action on-screen. This makes the commentary sporadically interesting but not valuable as a whole. DVD One contains a few other extras. Trailers for both the film's original release and for the restored movie's theatrical run appear. The disc also contains good production notes. Over on DVD Two, we start with Obsessed With Vertigo: New Life for Hitchcock's Masterpiece, a 29-minute and 17-second documentary about the film. Well, sort of - the program also discusses the movie's restoration. Narrated by Roddy McDowall, we find interviews with participants, film clips and both production stills and behind the scenes footage; this is intercut with material about the restoration. In regard to the interviews, we hear from Katz, Harris, Coleman, Novak, Robertson, Bumstead, Taylor, Hitchcock’s daughter Pat, filmmaker Martin Scorsese, writer Maxwell Anderson, production manager CO “Doc” Erickson, June Van Dyke of the Edith Head Collection, and actor Barbara Bel Geddes. Next comes the 54-minute and 49-second Partners in Crime: Hitchcock’s Collaborators. This area breaks into four smaller components: “Saul Bass: Title Champ” (10:31), “Edith Head: Dressing the Master’s Movies” (17:11), “Bernard Herrmann: Hitchcock’s Maestro” (14:43) and “Alma: The Master’s Muse” (12:23). Across these, we hear from Scorsese, Pat Hitchcock, credit designer Saul Bass, title designer Kyle Cooper, Saul Bass author Pat Kirkham, The Films of Alfred Hitchcock author David Sterritt, Hitchcock biographer Donald Spoto, Edith Head author David Chierchetti, costume designers Ruth Myers, Ruth Carter and Albert Wolsky, Hitchcock’s Films author Jack Sullivan, composers John Murphy and Nathan Barr, A Heart at Fire’s Center: The Life and Music of Bernard Herrmann author Steven C. Smith, Hitchcock’s granddaughter Mary O’Connell Stone, and filmmakers Guillermo del Toro, John Carpenter, and Joe Carnahan. The various featurettes offer nice glimpses of folks who added so much to Hitchcock’s films. Though the pieces tell us about the participants’ interactions with Hitchcock, they don’t limit themselves to those areas, as they spread into other aspects of the subjects’ careers. These turn into enjoyable, informative segments. For a chat between legendary directors, we go to the 14-minute and 18-second *Hitchcock/Truffaut. This provides an audio excerpt of Francois Truffaut’s extensive 1962 interviews with Hitchcock. 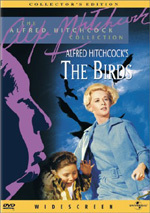 They discuss the film’s visuals, the influence of dreams on Vertigo, script and story issues, themes and characters, and some aspects of the flick Hitchcock doesn’t like. The chat moves slowly due to the lag in translation, but it includes some nice insights. Finally, we get an episode of *Alfred Hitchcock Presents. 1955’s “The Case of Mr. Pelham” (25:28) is a gripping and involving tale kept me rapt for the duration. Mr. Pelham seems to have a twin - or is he just losing his mind? That's the question over which you'll puzzle throughout this winner, which also features a really great ending. This marks the third DVD release of Vertigo, and it’s the best. However, it’s not significantly superior to the one that immediately preceded it. Those two offer similar visuals and identical audio, though the new one loses a mono mix. Otherwise, this one differs from its predecessor solely due to a few new extras. While those components have value, they’re not enough to make the set worth a “double dip” for fans who already have the 2005 release.